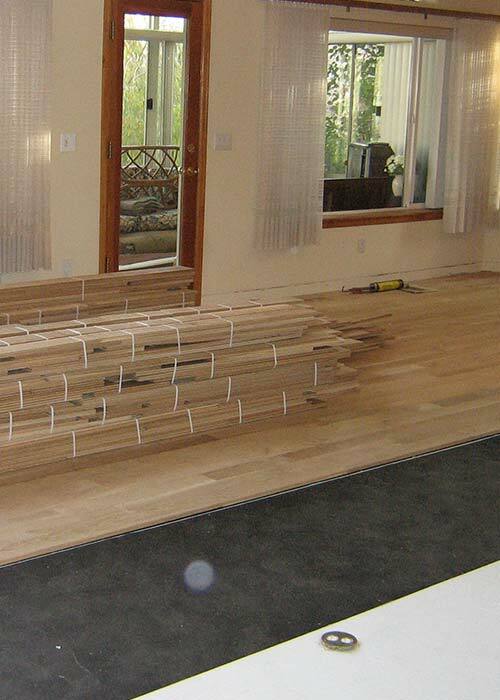 This is the most common flooring installation. These floors are installed as raw wood, tongue and groove product on all 4 sides; sanded, stained and finished on site to suit the homeowner's taste. A variety of stains and finishes may be used. There will be some noise and dust associated with this process. There's nothing quite like a good site finished floor. Pre-finished flooring is available in many styles, widths, colors and species. Pre-finished flooring is typically a 3/4" solid nail down product and requires no sanding. Pre-finished floors can be refinished numerous times. Floating floors are typically a laminated, snap together floor in a variety of styles and colors. Floating floors are excellent for over concrete installations such as basement remodels.